When submitting a job application, you may find that adding a personal statement is necessary to set yourself apart from other applicants. Maybe you’ve noticed that many of them aren’t using diversity statement samples for job application, or maybe you would like an opportunity to explain parts of your resume to the recruiter when they are reading your job application. Either way, looking through some of the job application personal statement examples below will help you create your personal statement quickly and easily. The job application personal statement is different from your college entrance essay, it has different structure and length. 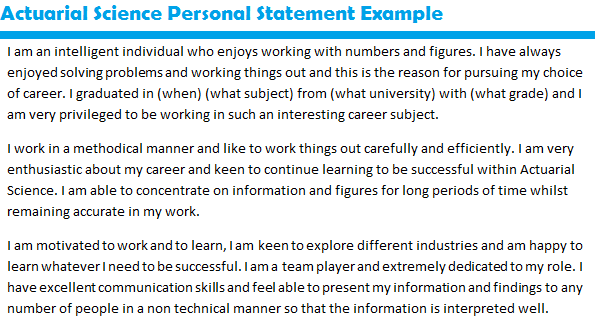 The first job application personal statement example that we are using is a great example of a template that you can use to position yourself in almost any position, although this is meant to be used in the Accounting and Finance industry. Not only does it embody many other job applications personal statement samples by discussing work experience briefly, but it also takes the time to discuss who you are as a person. 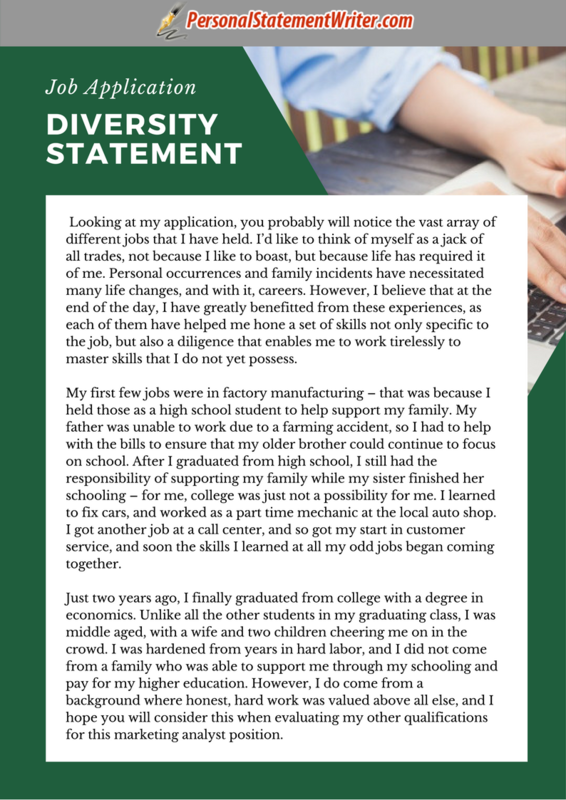 While you might not want to use the exact same wording that is used here, you can quickly modify this type of job application personal statement example to highlight your particular skill set. The second of the two job application personal statement examples that we are looking at today is for someone who is looking to find a job in the Actuarial Sciences, and as you can see it follows the exact same type of structure, but with a slightly different tone. Instead of specifically talking about how many years of experience they have, this example first discusses the university that they graduated from and their grades. There are two reasons for this. The first is that it is likely a younger applicant, meaning that they don’t have work experience to fall back on as heavily. The second reason is that the actuarial sciences are notoriously more focused on numbers (working with them is a major part of the job) than it is with less-calculable experience. The template above allows the applicant to show some of the facts surrounding their achievements before going deeper into what makes them a good applicant. 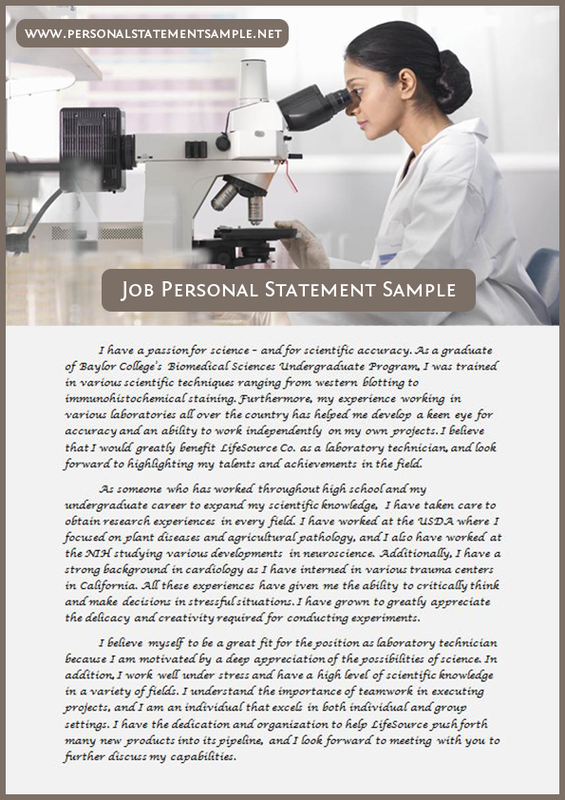 You can also see many useful samples like PhD personal statement example in our site. 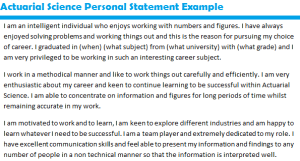 While both of the job application personal statement examples that we discussed here are templates, they are both great examples of what you might want your job application personal statement to look like. Take a look at them and make sure that you internalize the reasoning behind each of the segments, and think about how you would read these personal statements as a recruiter. That exercise gives you far more insight into how to write a great personal statement than simply practicing writing one ever could.